Matthew and Micah out of their orphanage and mental institution. If I said that a lot has happened in the last eight years, that would be a gross understatement. Sometimes, being “us” isn’t easy. Sometimes, I wonder what “us” would be like if Eli hadn’t ever been born. 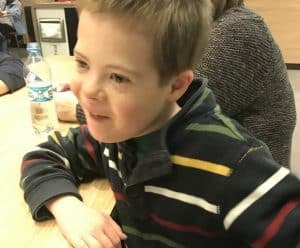 If Eli hadn’t ever been born, we would not have ever adopted four children from Ukraine with Down syndrome (that would also mean that, most likely, the many people who had their eyes opened to adoption from Ukraine and other places after we did it may never have done it either). 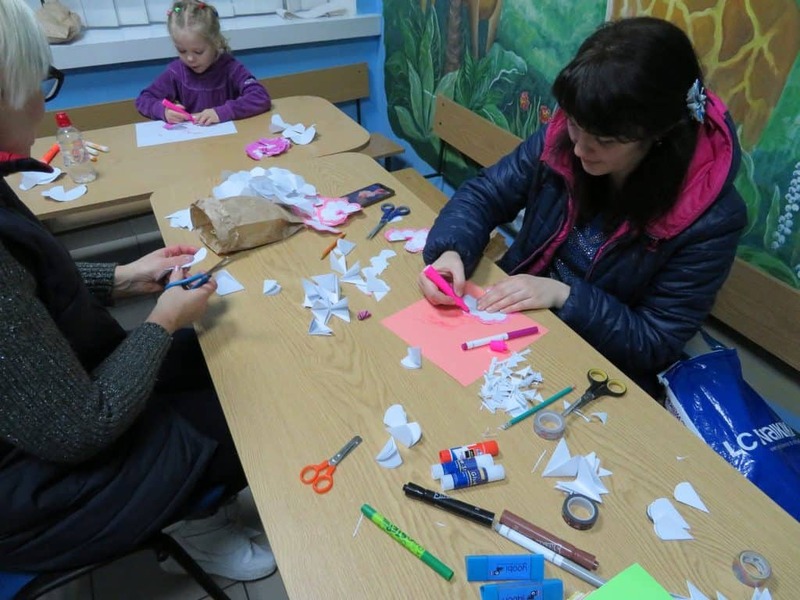 If we had not ever adopted kids with Down syndrome from Ukraine, we probably would never have had our eyes opened to the plight of the orphan with special needs or the desperate difficulties families have when they keep their children who are “different” here in Ukraine. So it would follow that we would never have answered the call of the Lord to move here even once – much less twice. Remember in the movie trilogy, Back to the Future, how so many events in all three movies hinged on one certain date? That’s kind of like March 25, 2004. Except the events of this day were real. Eli was born. Before you think I’ve lost grip with reality and given up on the sovereignty of God’s plan for each of us, I will remind us all of the beautiful words of Corrie Ten Boom. There are no ‘ifs’ in God’s Kingdom. His timing is perfect. 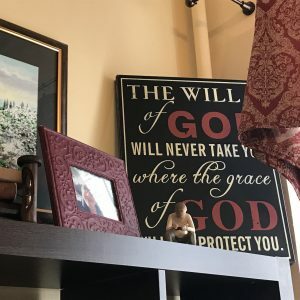 His will is our hiding place. Lord Jesus, keep me in Your will! Don’t let me go mad by poking about outside it. This coming Saturday, we will celebrate Eli. Thirteen years of life. Thirteen years that have changed us profoundly in ways that we could not have planned and maybe even not planned if we could. The fact is, though, that this is us. And we are very thankful that it is. We are grateful to God that He has done all that He has done. We don’t pretend to understand all of it. We haven’t liked all of it at the time. Yet, we do recognize today that God has been involved in every bit of it. He is a good, good Father. Wow! Where to start!? So many great things. Yes, there was still snow on the ground. Yes, it was still cold. But it came. There are lots of signs of spring around here, in fact. It’s the norm around here in the Spring and in the Fall. When we used to travel here several times a year on short term trips, the burning seemed really weird and irritating because the sky was filled with smoke all the time and you could barely breath without coughing your lungs out. Now it is a welcome sign of new life to come. Beauty comes from those ashes. Just like beauty comes from the ashes of our lives through Christ Jesus. 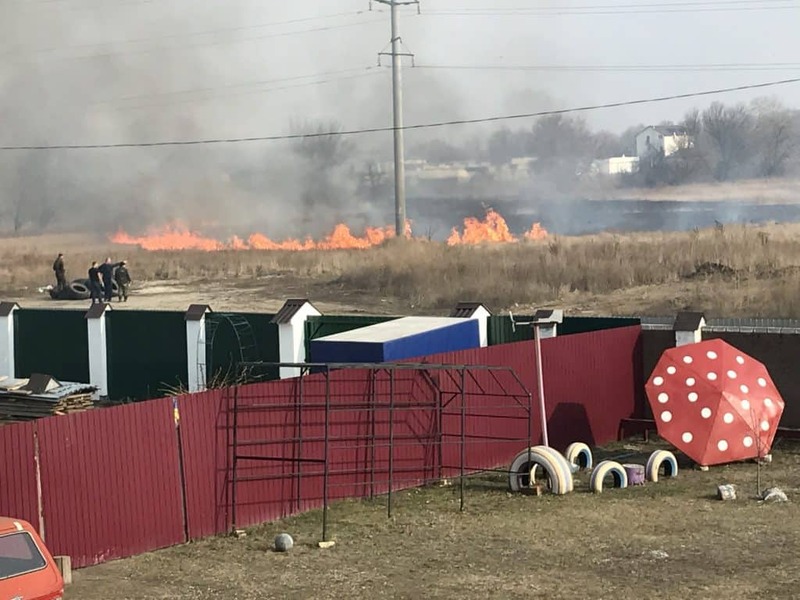 This particular burning of the field across the street from our house was not welcome because it was one of the windiest days I can ever remember here and burning embers were landing in our yards and roofs. Not safe. The men you see in the picture proceeded to bring a big road grater out and got a ring around the fire cleared out to stop it. It was a tense hour or so and there was a lot of yelling and worry. But thankfully, no one had damage to property or life and no yard even caught on fire. The fields all around burn daily and it’s a sweet aroma of Spring. The Changing of the Tires. You know Spring is here because everyone changes their snow tires back to the “Summer” tires. We are grateful to have the help of a young man who does odd jobs for us around here. 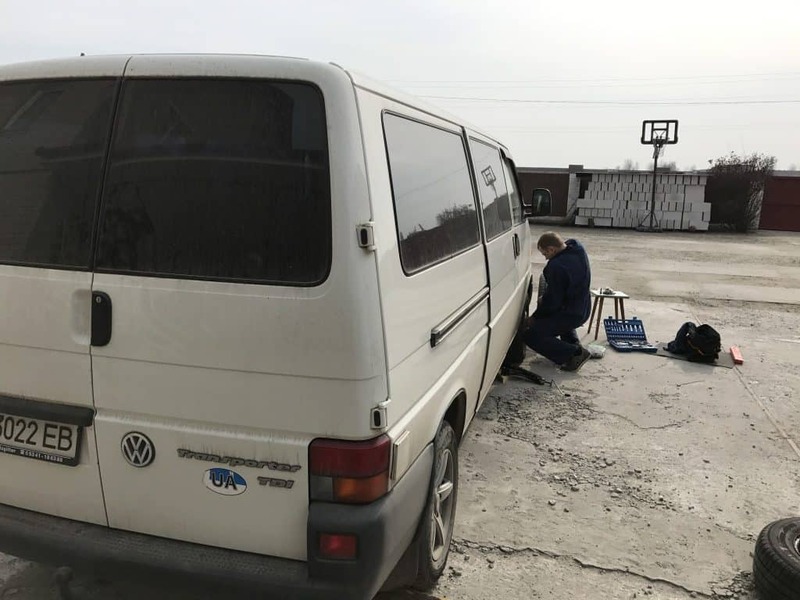 He had them changed in no time and got the van all clean for the Spring. Unfortunately, that same day, we had to go to the city and when you drive in the mist of wet roads and melting snow, you know what your car looks like after. Just like it does in this picture before he washed it. Our favorite sign of Spring is when the “First” comes into view. 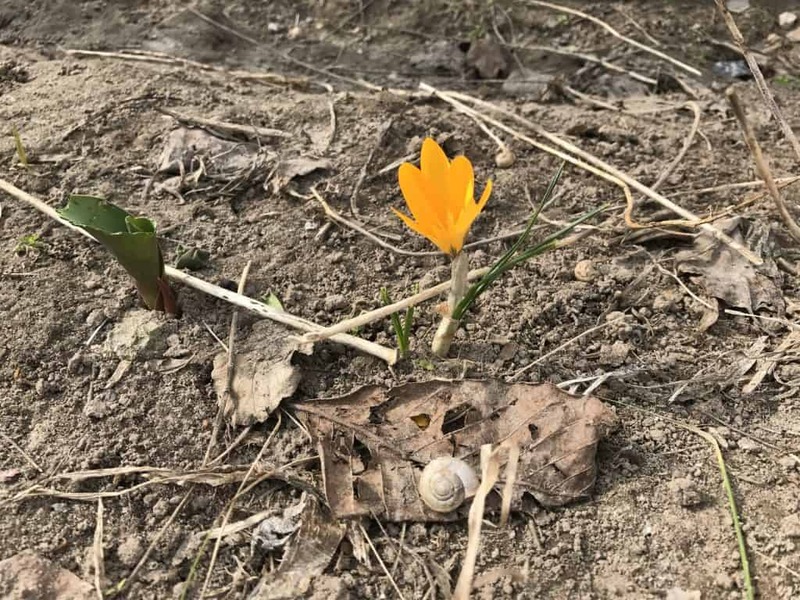 (That’s the first FLOWER, not the first SNAIL.) This beautiful yellow Crocus won the prize. Such beauty is on the way. Over the years, there have been many bulbs and perennials planted. We can hardly wait until late Spring and Summer when the beauty is almost too much to take in. 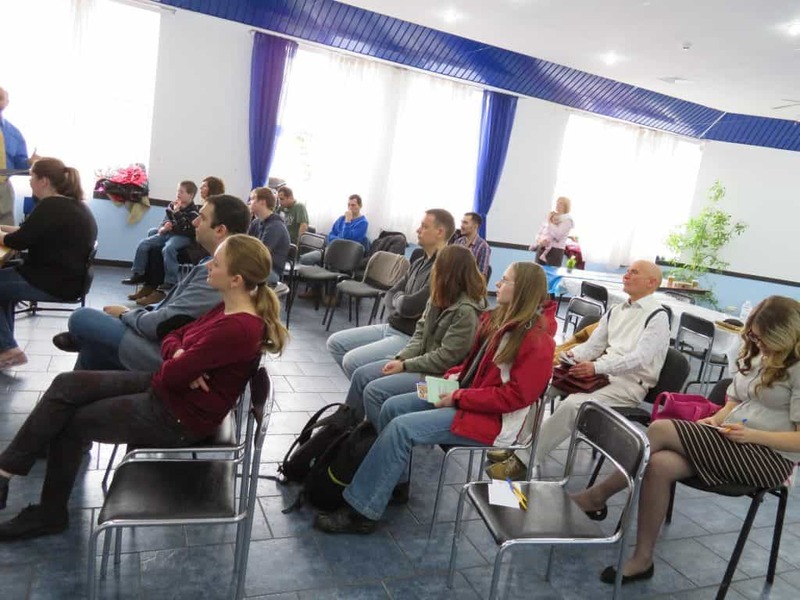 http://kifc.com.ua — It has been a very exciting start to KIFC. We have been very diligent to get things started correctly. Our pastors (of which, I am one) have been able to meet most weeks for prayer, dreaming, and planning. Our church is an international church. Meaning that we are targeting people from all nations. Kyiv is a huge melting pot of all nationalities and there are many languages. We have chosen English as our primary language because it is, at least, one of the main languages people try to learn when they are going to learn a second (or third or fourth) language. We are on the cusp of needing to offer translation into Ukrainian/Russian and hope to have that going in the next several weeks. We rent a large worship room in this multi-church facility called “Christ Cathedral.” There are at least a dozen different evangelical churches that meet in this building throughout the week. 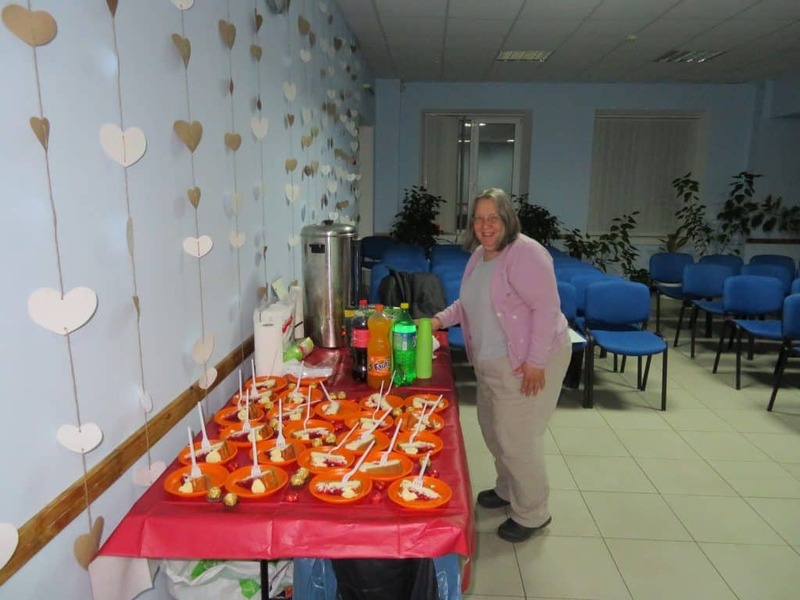 This is after the kids and Sunday School teachers left during the teaching time. It’s been an enjoyable adventure thus far! 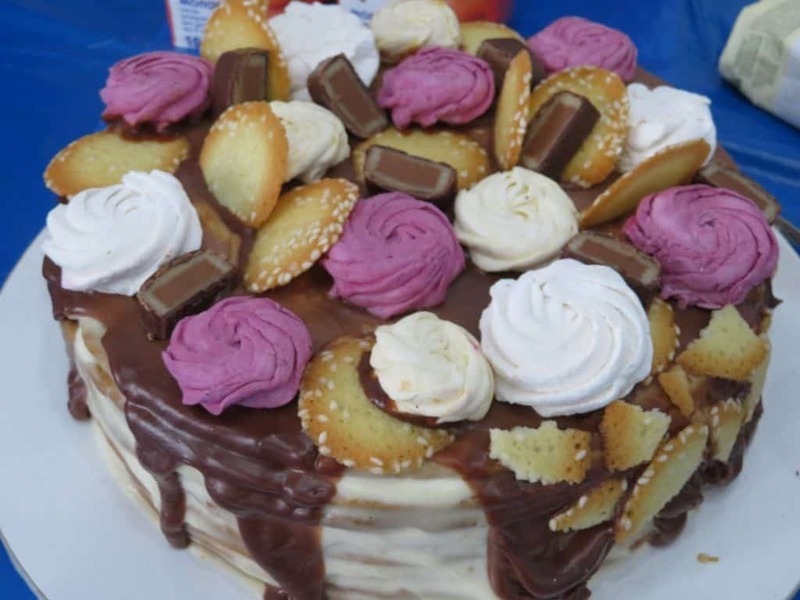 One of the young ladies made this cake for fellowship time. Quite a work of art, wouldn’t you say? 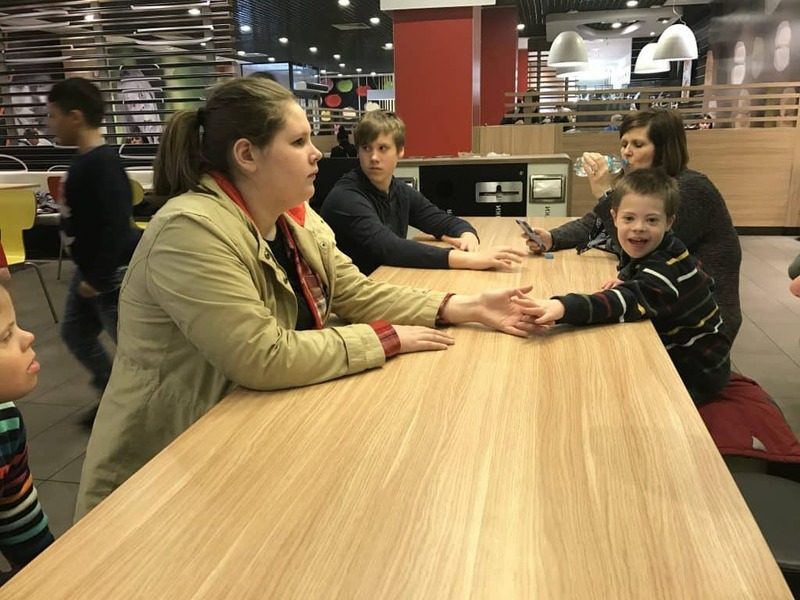 After church, we took everyone to McDonald’s and met another family there. I’m not sure why Eli is the only one that seems happy about the outing. But they all did enjoy getting out. This table was right in the middle of the restaurant by the entrance. We got quite a few second, third, and fourth looks. 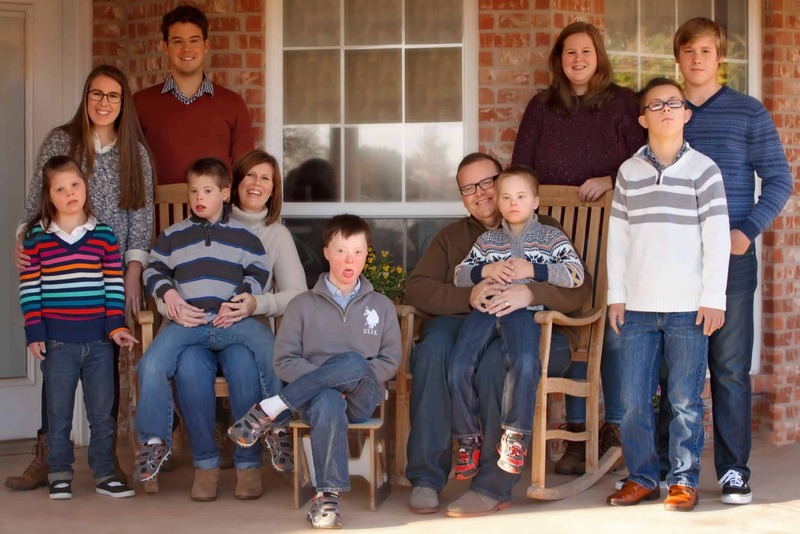 It’s good to get everyone out in public, though, so people see families interacting even though they are “different.” Honestly, it is sometimes hard to face the stares and whispers, but we count it as part of our ministry to help normalize difference (when related to differently-abled kids). 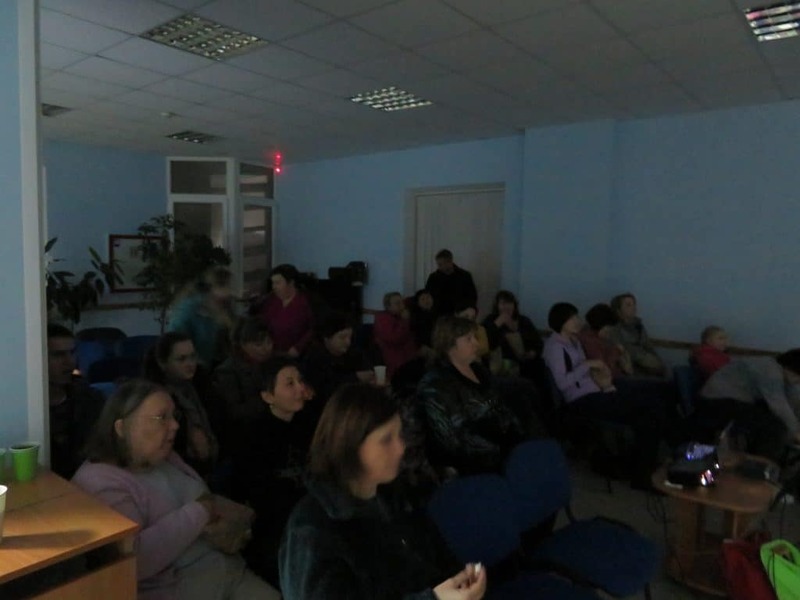 Two Fridays ago, we had a movie night at Grace Baptist Church in Brovary. We could not have our normal Bible Study at home because the bus that brings people was broken down. So we planned a movie night. We ended up inviting not just our ladies, but the whole church. We ended up with 31 there and it was very well received. 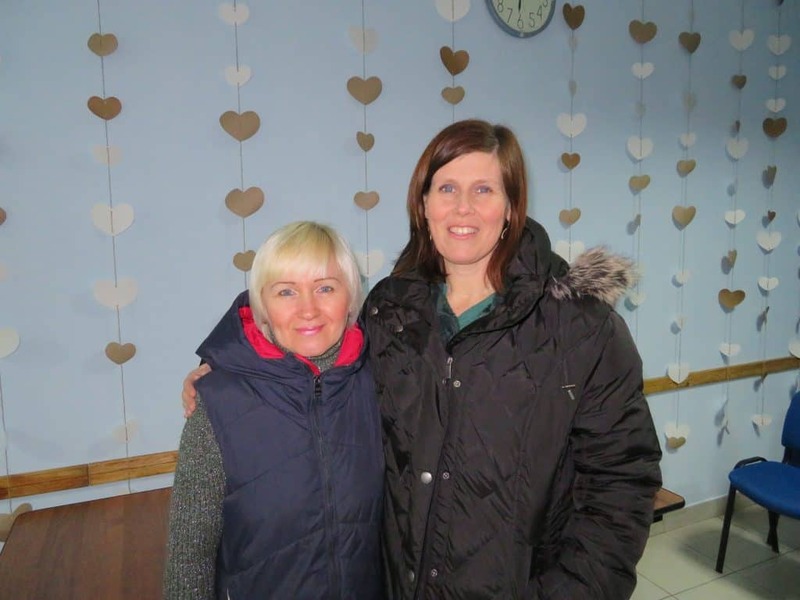 Our good friend, neighbor, sister in the Lord, Sveta, came and helped us. 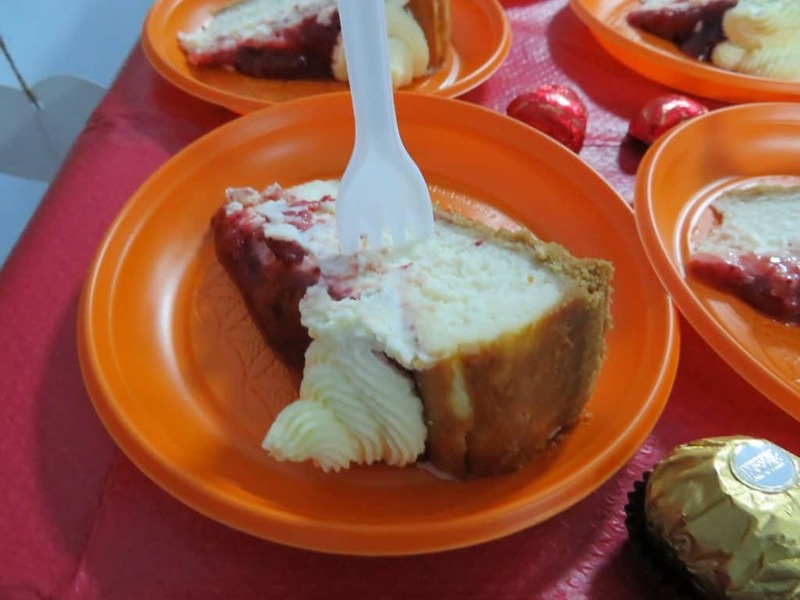 We had “American” cheesecake with Strawberries that we ordered from an American family selling them as a fundraiser for an adoption. It’s made with Ukrainian ingredients, but it was a taste of America, for sure! The ladies are still talking about it two weeks later. It was a real treat for them. 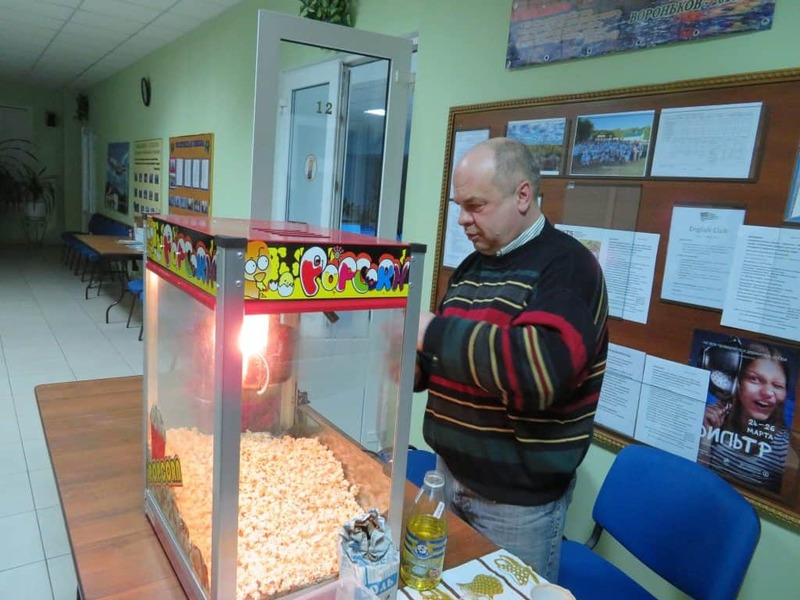 Sergey volunteered to use the church popcorn machine and make popcorn for us. 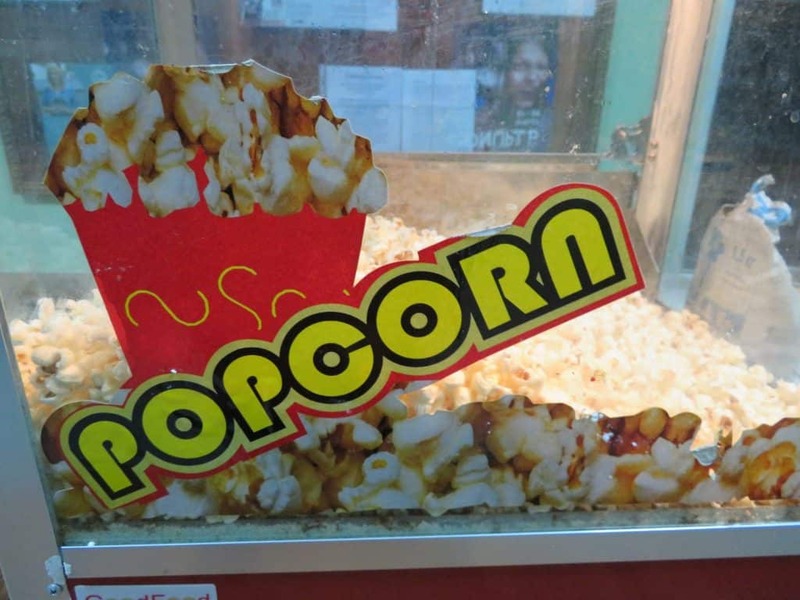 What’s movie without popcorn, right? Everyone enjoyed as much hot, fresh popcorn as they wanted. Jamie putting the finishing touches on the snack table. Preparing for the craft the children would do during the movie. 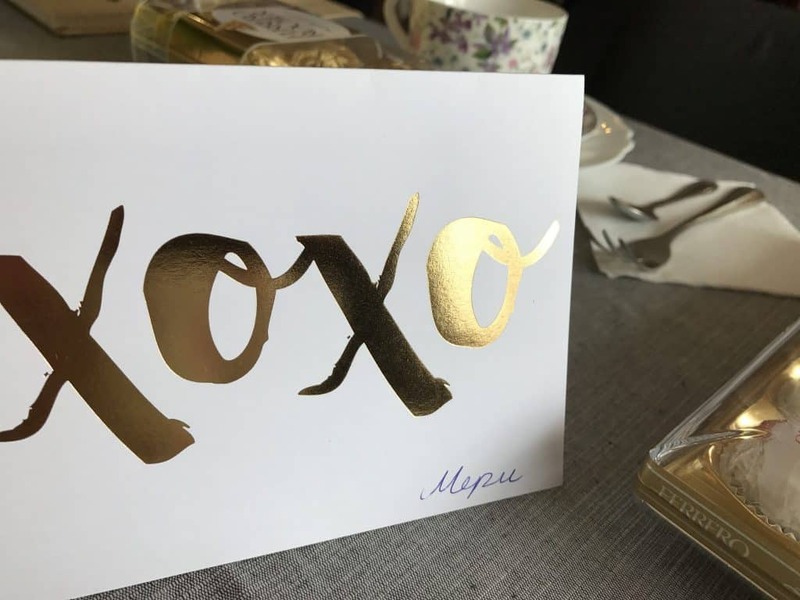 They made some beautiful greeting cards. The opening credits. I had the opportunity to address the group before and after the movie to talk about the love we should have in our marriages, our relationships with one another, and of greatest importance, the Love God has for us and we should have for Him. We have started. Again. Mary has her lesson on Monday. She will either go into Kyiv or she will have it by Skype. I go on Thursday afternoon. I plan to go into Kyiv as much as possible. I got to my lesson way too early because there was no traffic so off I went to my favorite little coffee spot near our teacher’s apartment. 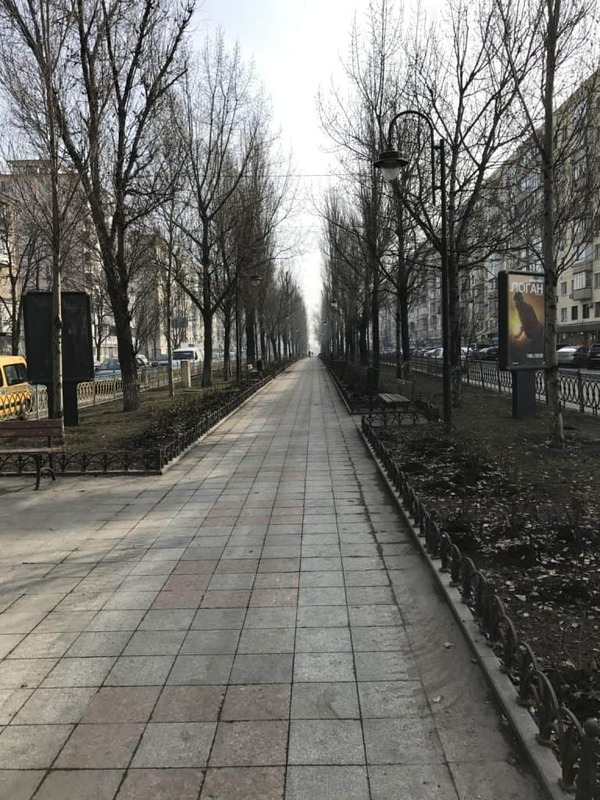 This boulevard, while not bad at the end of Winter, is gloriously beautiful during the Spring and Summer. I can’t wait to see it in full bloom. 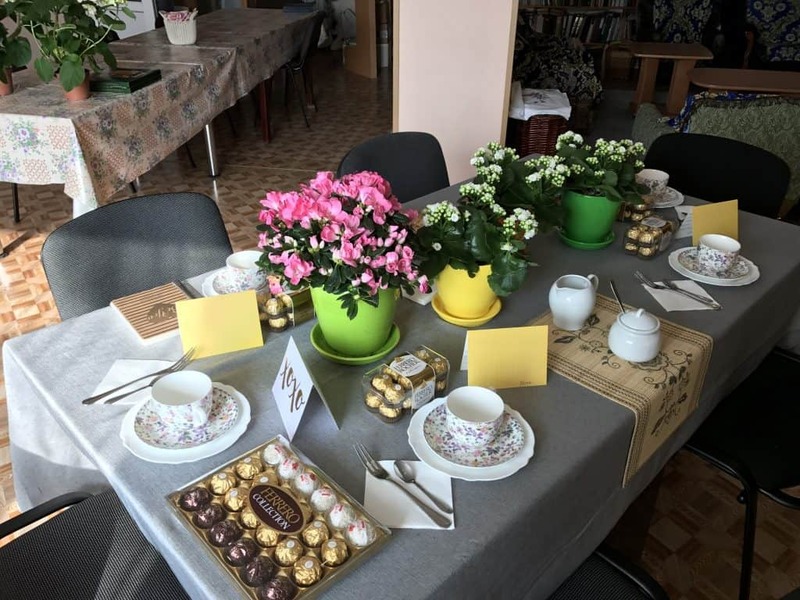 Here, in Ukraine (and across Europe), International Women’s Day is a huge event. I mean HUGE. 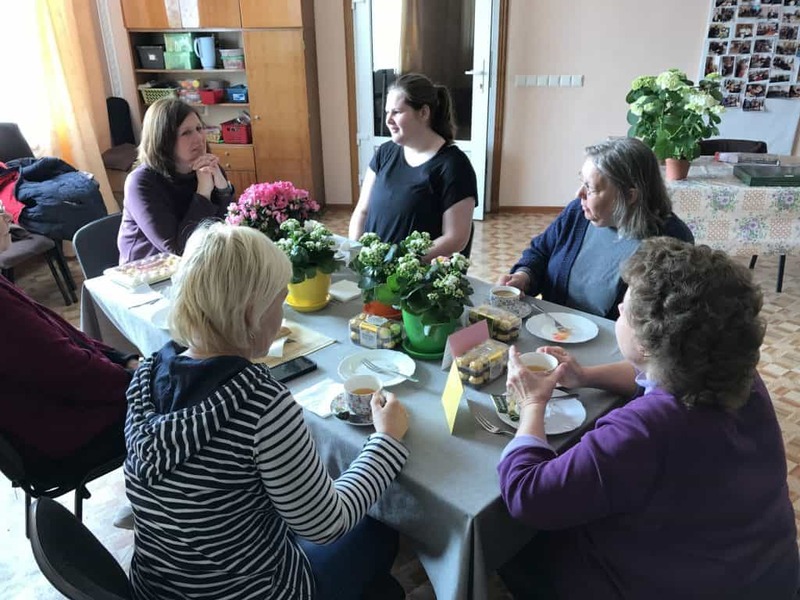 It was a great blessing that we were all at home that day and the other women in my life here in Ukraine were home. 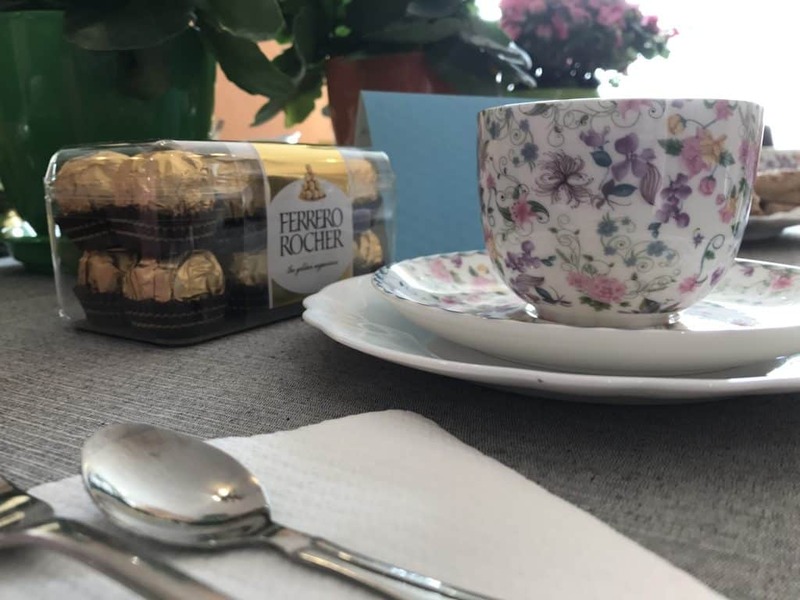 I hosted a small tea for them. Mary, of course, was the guest of honor! Everyone had a short note of encouragement (one of the attenders got a love note – I wonder who…), a small box of candy (one person got a large box of candy), their teacup was gift, and everyone got a potted plant (Bethany got a new notebook instead and the most beautiful lady got two big hydrangeas). The fare was tea, cinnamon scones, and cupcakes. 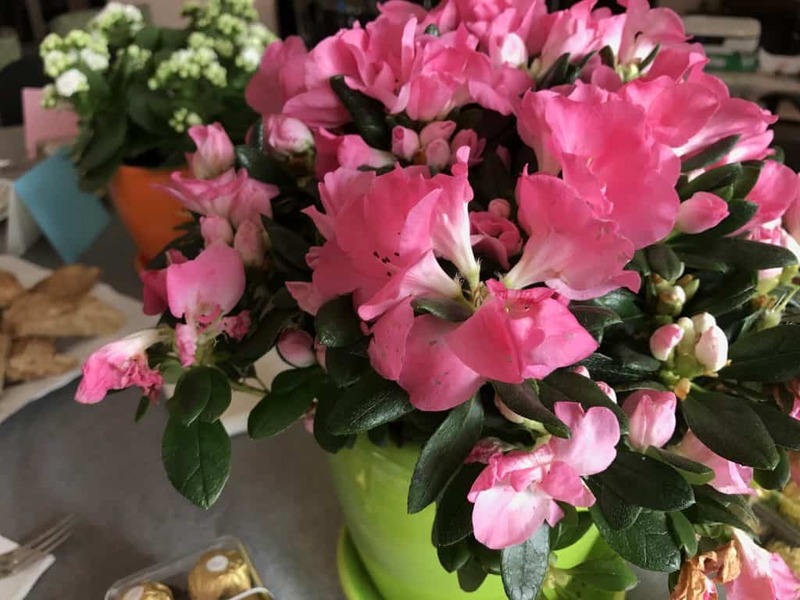 Mom got an azalea to add a bright splash of color in her rooms upstairs. It was nice to see them just sit, without any responsibility for setting up, cleaning up, refilling someone’s cup, etc. They sat and talked, laughed, told stories, and even cried a little. I think they recognized my gratefulness for each of them. Starting with Mary and clockwise: Mary, Bethany, Jamie, June, Sveta, Mom. And mom’s companion Bud (while he is a dog, and a male) was also invited and sat at her feet most of the time. One of my favorite things about where our house is situated is that we can see the sunrise from our bedroom window. Coincidentally, it is also one of my least favorite things about where our house is situated (in the Summer, the sun rises about 3:30-3:45 — that’s the middle of the night if you ask me). Mom’s little companion for the last fifteen years died last Tuesday. 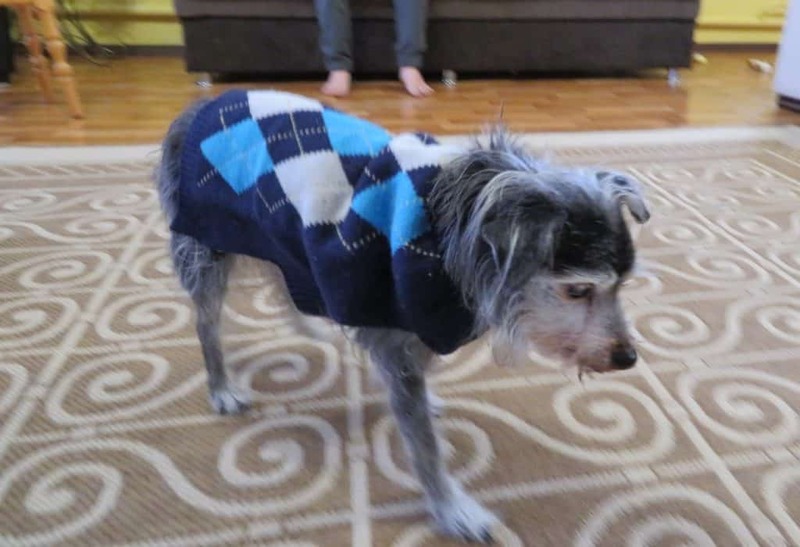 Her little dog, Bud, was a champ moving to Ukraine. However, his health has not been great for quite some time. In fact, we thought he was going to die around Thanksgiving but he rebounded and made the trip feeling good. About two weeks ago, he started feeling very poorly and pretty much stopped eating. He had several teeth that falling out and in fact part of his jaw started to disintegrate. He was in poor shape. My mom was trying to decide how long she should let it go before she took him in to the vet and make some really hard choices. But he slipped away from her peacefully early Tuesday morning. He will be missed. He got mom through some really hard, lonely days. I’m glad he got to be with her through the very hard transition of moving to Ukraine. I wonder if he held on so long knowing that she would need him. 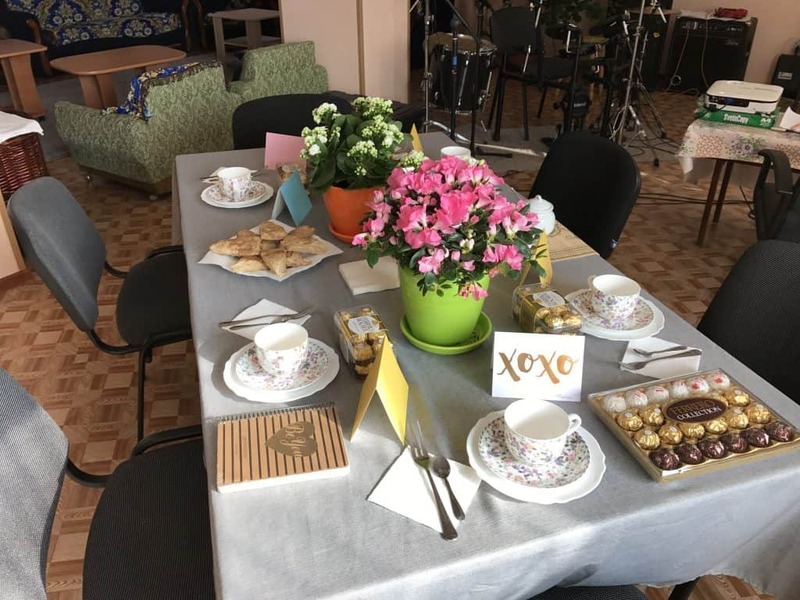 Thank you for continuing to pray for our family and for the ministry here in Ukraine. 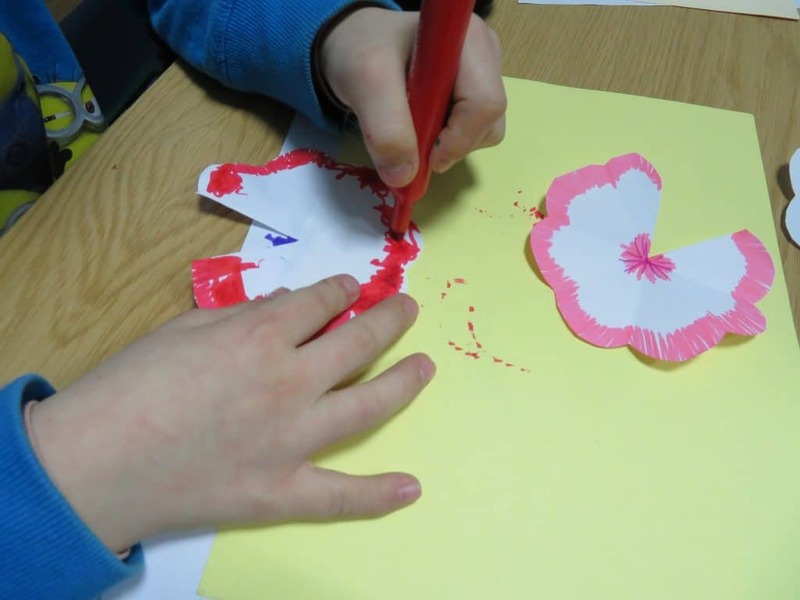 Thank you to those of you who so generously support the work financially. We couldn’t do this without you. I am so glad to be on your list for receiving updates from you in Ukraine. I did spend a few years along side of you in Moore. And I did get to hold Eli in the hospital when I came to visit soon after his birth! Who knew what would come into your lives after his birth?! Life changing for quite a few people. 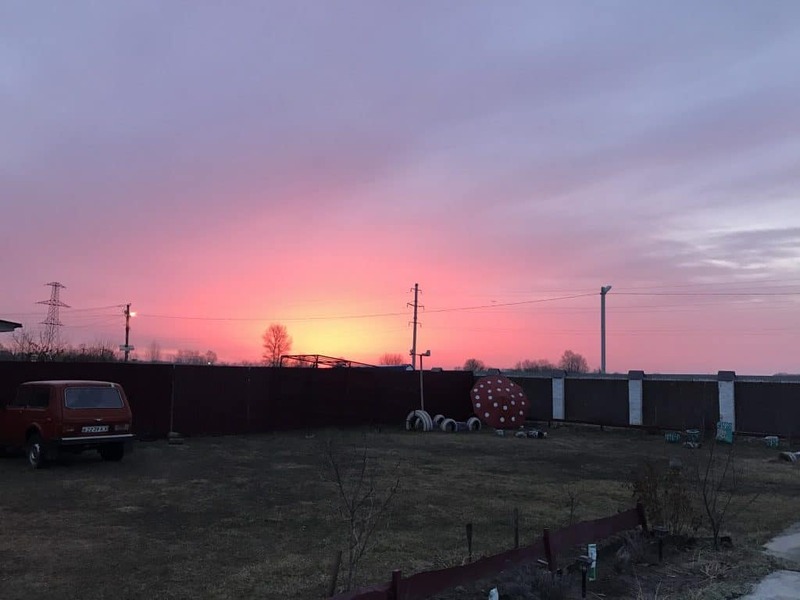 I miss Ukraine. It doesn’t look to encouraging that we will return. But we have not given up yet. Bob’s health has surprises each year. His heart Doc mentioned he has a blockage coming along 50% and he should see him before he goes out of the country again. 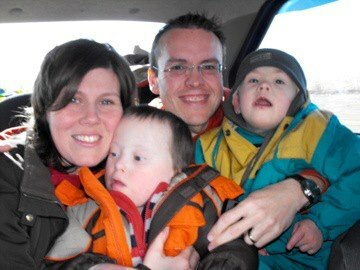 We had arranged to be in India for 6 weeks, participate in a friend’s son’s wedding, and hold several conferences. But On Dec.10th 2016 he fell at home and broke his tibia (a hairline fracture). We had to cancel the trip and lost at least $500 in the deal. Thankfully we bought flight insurance for the first time, otherwise it would have been a huge loss. He had to keep weight off his leg for 2 months. By God’s grace we had an electric scooter in our possession, and it was perfect for him to get around. Even now his legs are weak and he chooses to use it. He really zips around in the house and outside. He tires easily and needs a lot of rest frequently. He bought it at an estate sale for resale (he thought). So our lives have slowed down a lot. 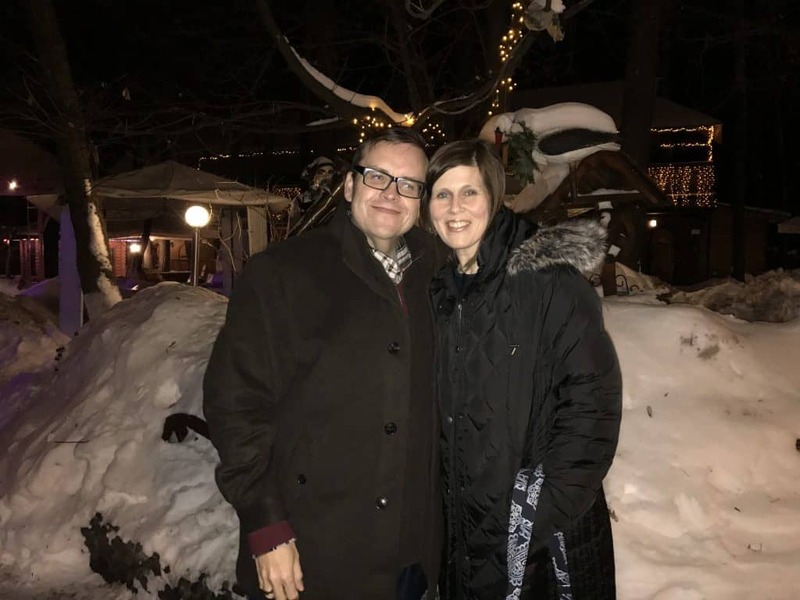 He teaches a class in Romans by FaceTime to Wawa, Ontario,Canada – way north of Michigan, and really has a good time with the 6 men who are his students. Our time of aging (70’s) is in full swing. Our conversation topics centers often about health. It’s an Organ recital! hahaha. As for me, I am in a new chapter, we changed churches and I left behind a lot of friends and responsibilities. Suddenly I have a lot more time on my hands. I am looking more into the neighborhood for ministry opportunities. and working on downsizing. Love to you ALL. Gail and Bob Long. 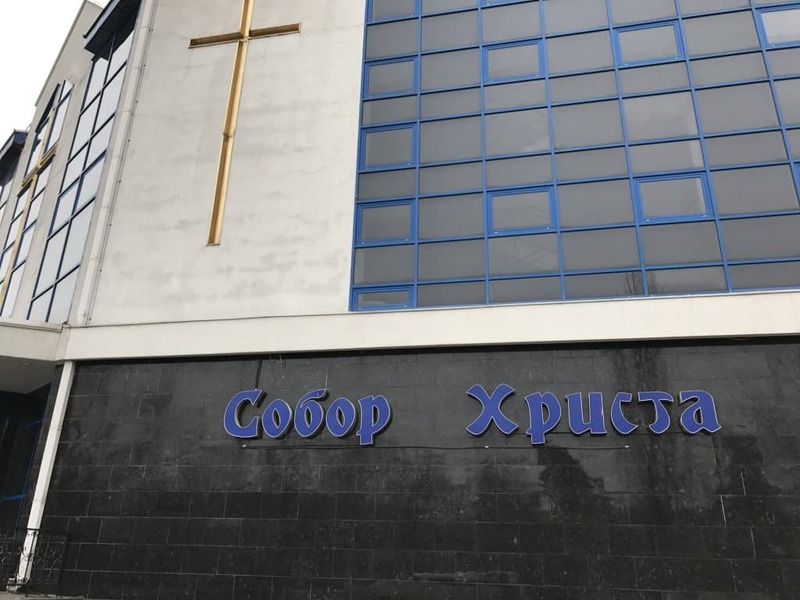 Thank you so much for such a gorgeous update, it really helps to know what your days are filled with these days (I know we can’t know everything, but..) Regarding the International Church, I wish so much to be there to translate the sermons! (but, you can’t be everywhere). 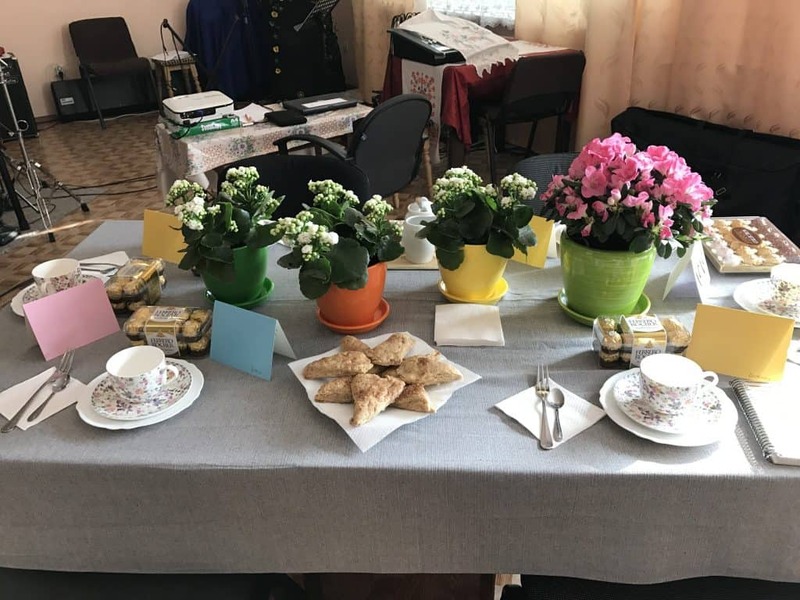 Regarding the Women’s Day celebration – wow, you certainly have a taste, British classy tea-time! It warmed my heart to see all my friends celebrating.. So sorry for Bud and so happy your Mom didn’t have to make that tough decision, that he died his natural death.. Praying for you and Mary and the kids.. So glad to hear from you. Your site was full of a lot of information. Thank you for sharing with us. It allows us to feel a part of your ministry. God has been so faithful to the Malone clan. So sorry to hear about Bud. I’m sure he will be missed. It’s church as usual here. Disciple groups are doing well. Cheryl and I have 12 regular attendees in our group. Waiting for God to speak to one or two of our couples to step out and lead a group. It’s Gods plan, we try to stay out of his way. Continuing to pray for all of you. Love you guys. Thank you for your message! It means so much to us when we hear from our friend in the States. That’s great news about your DiscipleGroup. We have started a couple here (one mixed, one ladies (which starts this week)). It’s a real joy and blessing!! 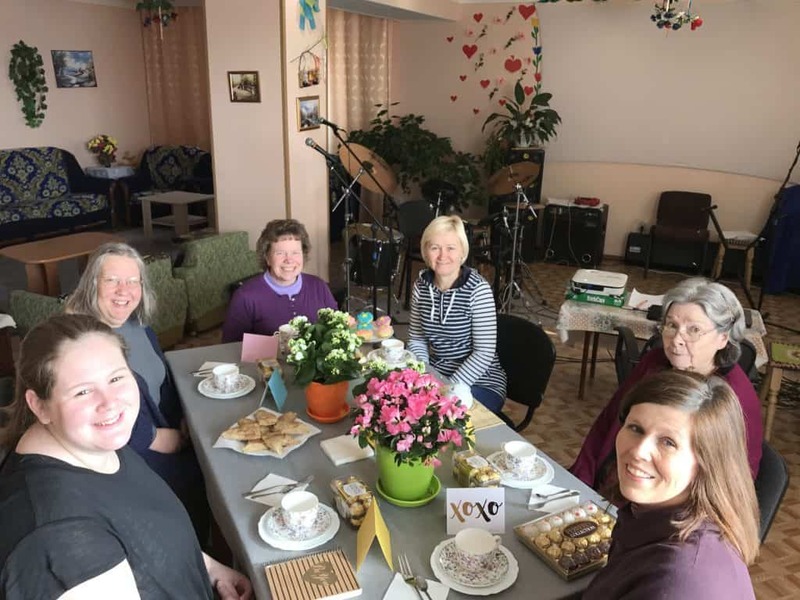 We miss you and our church family, but are thankful for the ability to obey God and be where HE wants us – here in Ukraine. Love you and thank you for the prayers! I enjoyed reading every word… for the 2nd time! Once in March and again today. Loved the pictures too. You continue to be a thoughtful, kind person with a servant heart. So nice of you to honor the ladies. I was sad to read about Bud crossing the Rainbow Bridge but glad to learn that he died a natural death. It is traumatic to have to take a pet to the vet to send them on their way. (((HUGS))) to your Mom.